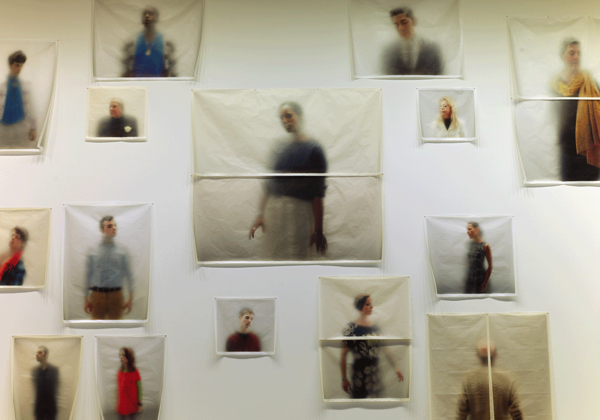 For O N E E V E R Y O N E, Ann Hamilton set up a photo booth at the ADAA (Art Dealers of America Association) art fair this past March and invited fairgoers to pose behind a semi-opaque plastic sheet, which she encouraged them to touch. They could not see out to the camera or the artist, though they were visible from the other side, especially where they came in contact with the material. This conflation of sight and touch is typical of the artist’s larger conceptual practice, which often seeks to engage the senses in ephemeral, site-specific experiences. In return for posing, participants were given a print, not of their own portrait but another’s, suggesting that it is not the particular individual or their likeness that holds meaning, but rather their embodiment of a universal humanity. Printed on gampi paper and installed in a loose, diverse constellation, the prints flutter in response to displaced air and begin to curl as they take on moisture, appealing to viewers’ tactile senses and perhaps creating an illusion that they are reaching out for human contact.